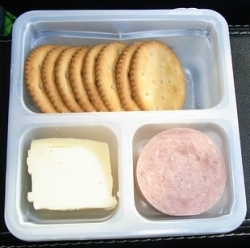 Kraft Heinz Company has recalled 959 pounds of Lunchables Ham and American Cracker Stackers after food inspectors confirmed the products were mislabeled and contain wheat and soy. Those ingredients, which are common allergens, were not declared on the packaging. Although the Fullerton, California, establishment hasn’t received any reports of illnesses, the Department of Agriculture’s Food Safety and Inspection Service (FSIS) announced on Sunday that it identified the undeclared allergens after receiving a customer complaint, according to an FSIS news release. 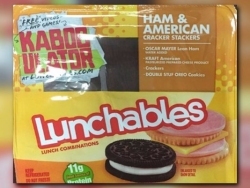 Inspectors determined mislabeling was to blame: The Ham and American Cracker Stackers had been incorrectly mislabeled on the back of their packages with the label for a Nacho Lunchable product. The Nacho Lunchables do not contain wheat and soy, and so those ingredients were not declared on the labels despite being present in the product. Affected items are in 3.4-ounce packages, and have a use by date of Dec. 25, 2016, and production times ranging from 9:13 to 10:00, which is stamped on the side of each plastic container. Under their USDA marks of inspection, the recalled items have the establishment number “EST. 537K.” The FSIS advised consumers who purchased the recalled items to throw them away or return them to their place of purchase. According to the FSIS release, consumers with questions can contact the Kraft Heinz Consumer Relations Center, at 1-800-573-3877. Symptoms of food allergy attacks can range from vomiting and diarrhea, to inflammation of the esophagitis (EoE), a condition wherein the esophagus becomes inflamed, according to the American Academy of Allergy, Asthma & Immunology. In addition to wheat and soy, eggs, peanuts and shellfish are common allergens. Food allergy attacks can be life-threatening. © 1252 Chicago Hispanic Newspaper, Lawndale News, Hispanic Bilingual Newspapers, Su Noticiero Bilingue. All rights reserved. XHTML / CSS Valid.